Cline learned that electrostatic machines can target high-touch surfaces and hard-to-reach places in a variety of settings that standard application tools struggle to get. He immediately recognized that this technology could be a powerful tool to more successfully serve some of 4M’s customers such as call centers or fitness centers, helping them stop the spread of germs and potential outbreaks of some types of sickness within their buildings. After the trade show, 4M purchased one of the Clorox 360 machines, but it wasn’t long before they realized they wanted more. “With cold and flu season rapidly approaching, I think it was late October or early November when we did buy a machine. Since then, I think we have purchased three or four more machines to use throughout all our markets,” says Cline. Before the purchase of the electrostatic machines, 4M’s cleaning protocol consisted of thorough manual cleaning with spray bottles and microfiber cloths to scrub surfaces. 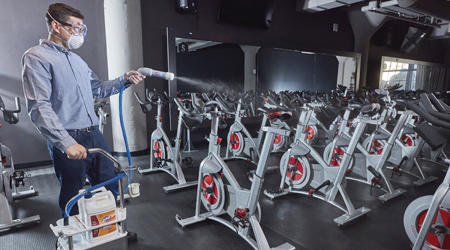 With normal spraying, the coverage of surfaces is determined by the direction in which the team member sprays and where the droplets fall based on the effect of gravity, which could result in uneven surface coverage even with the most experienced employee. Naturally, the 4M workers who were slated to use the new equipment had to be trained. And, while 4M typically makes sure to spend more than adequate time on training and education, employees using the new system were quickly brought up to speed, which made for an easy and enthusiastic transition, says Cline. Workers needed training about the processes, whether it was sanitizing or disinfecting. And, they were trained to understand that they don’t need to hold the spray gun in one spot and soak an area. Rather, they just need to mist the surfaces, making sure to cover each area. The kill time is about two minutes for bacteria and under two minutes for viruses. Best of all, no wiping is required with electrostatic spraying as it is with other procedures, and it’s safe for all surfaces including electronic equipment. One of 4M’s team managers who has been working the system has been delighted with training time and product performance. The simple training combined with the innovativeness of the product has led to a boost in productivity. “We are now able to clean and disinfect areas that we couldn’t have imagined getting to,” says Irizarry.